Dating from the 19th century they cover a strip of land from East to West on the North slope of the town. Basically its a strip of land where they build beautiful summer houses surrounded by orange and lemon orchards, whose orange blossom perfume is something special. The orchards of La Bola, la Torreta, Los Gray, Marta y María and others are of particular interest. 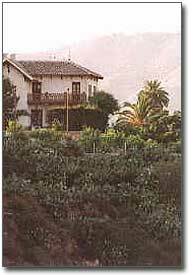 This house is typical of the group of houses of Totana which belong to buildings located mainly in the areas of Los Huertos and Mortí, areas of irrigated land with an abundance of orange orchards which for years have been the richest in the town. They are built at the base of the Sierra and the Santuario de la Santa, which makes this area one of the most fitting for the summer. Its general construction and the luxious front allow you to glimpse the economic condition of its owners, generally wealthy people. They started to build these houses at the beginning of the century. In general they have two floors and are adorned with turrets or lofts looking out onto large balconies. The Sanctuary of Santa Eulalia de Mérida, patron saint of Totana, is one of the most popular places outside of the town. Situated in a beautiful spot at the foot of Sierra Espuña, 7km from Totana and 600m above sea level. Its accessible by a road surrounded by pine groves and orchards where stately houses of the last century are built. The origin of the sanctuary is placed at the second half of the first century; documentation exists from the 14th century where they already had news of the existence of a small sanctuary, built by the gentlemen of the Order of Santiago, on land given by King Alfonso X ´El Sabio´ to Don Pelayo Pérez - Head of the Order of Santiago - given in exchange for some boundaries and land which the Order owned. On December 10 the followers of Santiago took possesion of Aledo and Totana, the day which commemorates the death of Eulalia de Mérida, whose hermitage takes her name, following the custom of dedicating the event to the Saint of the day. The present day sanctuary was built with alms from the followers in 1574. The worship of the Saint was almost extinguished and only a small centre of worship remained. According to C. Guitiérrez, around this time a Council Act released a report where it said that "...there had been a hermit who because of the war abandoned the place..." Then a man named Alonso de Murcia installed himself there. He and his son gave wine for charity. Later the place became property of a certain Ginés Arredo, who decided against continuing the custom established by his predecessors. Consequently, the Town Hall fined him, obliging him to " deliver wine to whoever should ask for it". Soon the town council became interested in the hermitage as a centre of worship and promoted its first restauration in 1498 it was already described as "... a nave with good walls and covered in good wood with a good flat roof above and good doors with an iron lock...". You can also find a description of the Saint "...striking, she had a green skirt and a linen blouse, some black beads and a small purple cloak from London trimmed with silk, a corset with sleeves and a dark ribbon..."
In the last third of the 16th century devotion to the Saint grew, believing her to have miraculous powers, curing the sick and the crippled who drank from the fountain situated opposite the Hermitage, to which curing properties were attributed. The church is Tuscan style formed by a central retangular nave, the roof is a mixture of wood and crafted Mudejar. Inside the altarpiece of the main alter is the work of Jerónimo Caballao and it´s dated from 1717. In the 18th century various reforms were carried out to widen the body of the hermitage and to build a baroque octagonal camarin (small room behind the altar) built upon the cavern where tradition has it as the place where the Saint appeared and where the first altar was built. The walls are covered with paintings dating from 1624 and they depict the life and miracles of the Saint, Jesus Christ and the Franciscans. The work, of approximately 200 square metres, with 48 scenes divided in two strips, includes a total of 216 main figures and is attributed to friar Antonio Bernón, who acted on the express request of the frequent visitor to the Order of Santiago, Don Diego Ramírez of Arellano, - in view of the fact that the Priest told him about the large amount of miracles that the " Blessed Saint Eulalia had performed and performs" - the said marvels which seem to be genuine were painted on the church walls but were clearly painted by a painter "who knew how to do it very well" and are so well looked after that they cause the devotion of the worshippers "and not the laughter as these paintings usually cause, the necessary has been spent on them” - the paintings act as a backdrop to two borders with sans serif and the Coat of Arms of Spain, the Order of Santiago, Totana, Aledo, Murcia, Cartegena, Lorca, Caravaca and Yeda. The line separating the strips of the murals was drawn by the Fransican Order. Saint Eulalia de Mérida (292 ac) was raised to the altar by Pope Urbano VIII in 1644. She was proclaimed Patron Saint of almost all of Christian Spain and nowadays is the only Español Saint from the first centuries which has remained present amongst the religious Saints. Her remains are preserved in Oviedo Cathedral. There is a traditional pilgrimage on the 7th January in honour of the Saint where the people from Totana and visitors come together in honour of its Patron Saint, enjoying it as a religious, openly traditional and gastronomic holiday. Situated near the Saint Eulalia Sanctuary, with images of Anastasio Martínez (1965) and culminating in "El Balcón" with the "Sagrado Corazón de Jesús" (holy Heart of Jesus) monument, by Nicolás Martínez. (1954).